These models are designed for those who require an alternative to the larger TA510 or DP120. The TA5 range with 6' or 7' headroom is a substantial but slightly narrower trailer, ideal for navigating rural tracks and lanes. The TA5 6' and 7' are available in 8', 10' and 12' body lengths. The 8' and 10' versions have a maximum gross weight of 2700kg, while the 12' heavy duty version offers 3500kg maximum gross weight. All sizes are available with either the standard ramp, combination ramp doors or with the EasyLoad™ ramp and folding deck system. 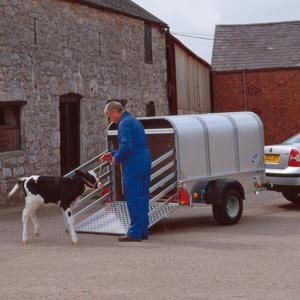 The award winning EasyLoad™ ramp and folding deck system has been designed to enable the handler to load two decks of sheep without having to manhandle large weights. Fitted with twin axle beam and leaf sprung suspension, galvanized steel chassis, aluminium side panels and heat reflecting roof panels. The rear ramp is covered with grip face aluminium planking and is spring-assisted for ease of operation. The flooring is durable pressure treated timber planking covered with slip resistant aluminium treadplate. TA5 models are also available with 4' headroom. These lower headroom models have a maximum gross weight of 2700kg and are available in 8', 10' and 12' lengths. Fold-up aluminium treadplate sheep deck system with ramp and provision for stowage of deck supports and rear barrier inside the trailer (not available on 4' H/R models).